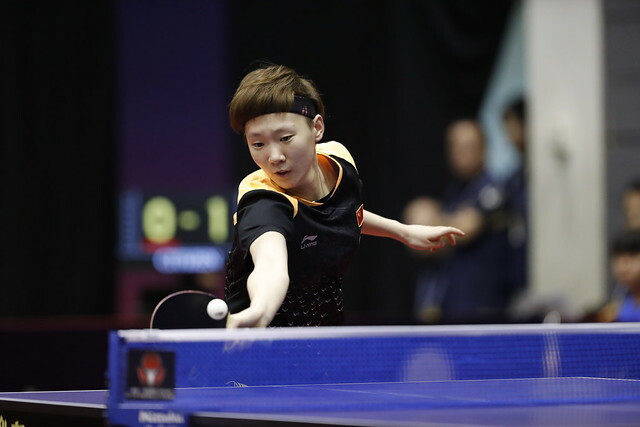 Spectators in Kitakyushu witnessed an exciting conclusion to the race for the Seamaster 2018 ITTF World Tour Lion Japan Open with day two of the qualification tournament featuring big upsets and nervous moments for a few notable players. Here’s a look back at how the action unfolded on Thursday 7th June. Claiming his first ITTF World Tour Men’s Singles title last month in Hong Kong, Kazuhiro Yoshimura continues to go from strength-to-strength with the Japanese star securing his qualification for the main event in Kitakyushu. Making a slow start to his final qualifying match, Yoshimura recovered from two games down to bring Chen Chien-An’s campaign to a shock halt (6-11, 3-11, 11-5, 11-6, 11-3, 11-5). Responsible for a major upset on the opening day of qualification when he knocked out João Geraldo, now Yuta Tanaka has added another big name to his list of victories. Trailing by two games to one Yuta Tanaka prevailed by the narrowest of margins (2-11, 11-9, 7-11, 11-9, 13-11, 8-11, 11-9) to eliminate World.55 Masataka Morizono. Zhang Jike is safely through to the main draw after the Chinese star rounded off his qualification journey with a victory over Lin Yun-Ju (13-11, 11-7, 11-9, 6-11, 11-9) and spectators were treated to an absolute classic in the lower half of the draw as Zhang Jike’s fellow compatriot Yu Ziyang lost out to Korea Republic’s Jeoung Youngsik in a dramatic seven games battle (11-3, 11-7, 6-11, 7-11, 13-15, 11-8, 11-9). In the final round of Women’s Singles qualifiers the host nation’s Minami Ando produced an excellent performance, defeating Korean opponent Jeon Jihee in a tight seven games encounter (11-3, 2-11, 11-9, 4-11, 10-12, 17-15, 11-4) but for Haruna Ojio a meeting with Romania’s Bernadette Szocs (11-4, 10-12, 11-5, 11-6, 7-11, 11-6) proved one step too far as the 12-year-old star exited the proceedings. Doubles qualification fixtures also featured as part of Thursday’s action as partnerships battled it out for main draw positions in the Women’s Doubles and Mixed Doubles events. Tin-Tin Ho and Ma Wenting produced a spectacular effort in the race for Women’s Doubles qualification with the English and Norwegian pairing combining well to defeat Singapore’s Zeng Jian and Zhou Yihan in five games (13-11, 9-11, 11-9, 4-11, 11-5). With the rest of the unseeded Mixed Doubles partnerships receiving BYEs through to the Round of 16 there was just the one qualification fixture to be settled with the Slovak duo of Lubomir Pistej and Barbora Balazova accounting for Thailand’s Yanapong Panagitgun and Jinnipa Sawettabut (11-6, 7-11, 11-4, 11-1).